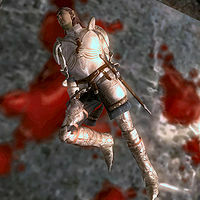 The Fallen Knights of the Thorn were colleagues of Farwil Indarys who entered the Oblivion Gate outside Cheydinhal with him and Bremman Senyan in an attempt to close it and save the city. The attempt failed, and Farwill and Bremman were stranded inside a gate they could not close. 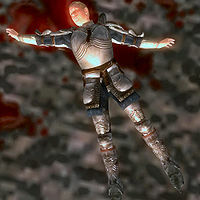 This knight is found outside the exit from the cave known as "The Bowels" in the Cheydinhal Oblivion world. He wears a steel cuirass with tan linens and carries a brown shirt and some gold. This knight does not appear in the game. He would have worn steel greaves with a burgundy linen shirt and a pair of doeskin shoes, and carried a pair of tan linens and some gold. 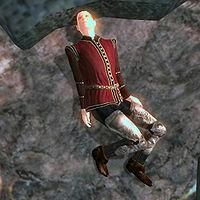 This knight fell in the cave known as "The Bowels", not far from a door to the outside. He wears steel boots with light brown linens, and carries a steel longsword, pigskin shoes and some gold. 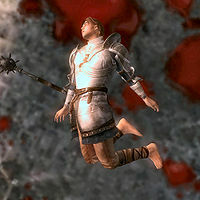 The fourth knight fell close to the Oblivion Gate back to Cheydinhal. He wears steel boots, greaves, cuirass and gauntlets, and carries a steel shortsword, a blue & green outfit, quilted shoes and some gold. This knight does not appear in the game. He would have worn a steel cuirass and matching boots with a quilted doublet, and carried a pair of quilted shoes and some gold. This knight does not appear in the game. 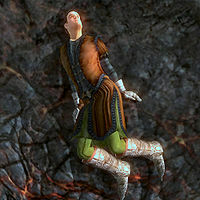 He would have worn Steel greaves, boots and gauntlets, with a russet felt outfit, and carried some gold. 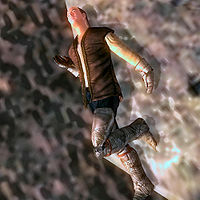 This knight fell on the bridge over the moat of lava, next to the body of a Scamp. He wears Steel greaves, boots and cuirass, and carries a pair of burgundy linens, a burgundy linen shirt, a pair of doeskin shoes, and some gold. This knight does not appear in the game. He would have worn Steel greaves, boots and gauntlets, with a brown shirt, and carried a pair of quilted shoes and some gold. 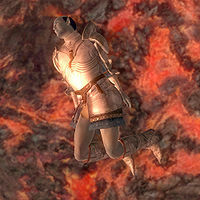 Amminus Gregori tells you that Farwil "entered the Oblivion Gate with six other men", but only Bremman and four bodies can be found. 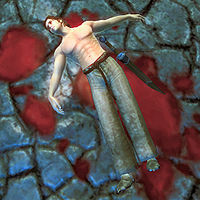 Eight Fallen Knights are defined in the CS, however. This page was last modified on 27 December 2013, at 01:08.